AUSTIN - Today 56 Texas business leaders sent a letter to Governor Greg Abbott, Lt. 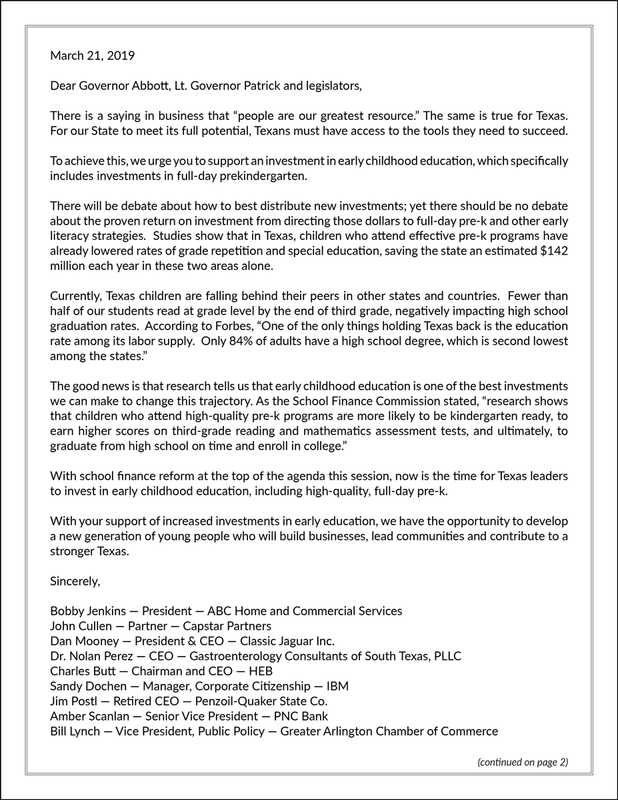 Governor Dan Patrick, and the members of the Texas Legislature urging them to “support an investment in early childhood education, which specifically includes investments in full-day prekindergarten.” The letter from leaders of several Chambers of Commerce, H-E-B, PNC Bank, IBM, and other businesses comes after top lawmakers in the Texas House and Senate filed school finance bills to fund full-day pre-k.
Texas currently provides school districts with funding to offer voluntary half-day (three-hour) pre-k to four-year-olds who are learning English, come from low-income families, or meet other eligibility criteria. Because full-day (six-hour) pre-k is more effective for kids and offers a schedule that allows more working parents to enroll their eligible children, many school districts draw on local funding to provide a full-day program. The school finance bills under consideration this legislative session — HB 3 by House Public Education Committee Chair Dan Huberty and SB 4 by Senate Education Committee Chair Larry Taylor — would provide school districts with funding to offer full-day pre-k to currently eligible children.